Everyone who goes to airshows seems to love the USAF Heritage Flight. Few probably understand the complexity of organizing their air show appearance. Warbird Digest's Greg Morehead recently wore two hats, one as an airshow organizer and the second as a photographer to bring readers the details on how it all comes together. Trent Latshaw is the caretaker of a fabulous P-51D Mustang. Scott Germain visited with Latshaw to discover his passion for warbirds and shot some amazing photos. A beautiful classic German trainer has returned to the air. 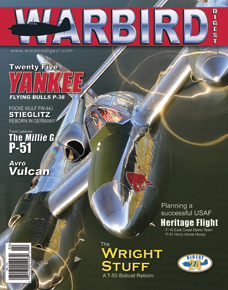 Stefan Degraef and Edwin Borremans bring Warbird Digest readers the story of this rare aircraft. Unquestionably one of the most famous of surviving World War Two fighters, P-38 N25Y just underwent an incredible restoration effort by Ezell Aviation for new owner, Flying Bull. Noted P-38 expert Kevin Grantham traces the extensive history of this fantastic fighter. Scott Slocum caught up with N25Y over West Texas for the air to air photos. Frank Mormillo takes a look at what is certainly the most complex and costly warbird in the world... the Avro Vulcan which took flight once again during 2008.